I used to keep a mental tally, when I was younger, of all the mature things I achieved that day vs the stupid things that let me down. For example, I might have come up with a witty retort to someone insulting me (unlikely, I’ve never been quick on my feet, unlike some of the silvertongued out there) but managed to trip and fall flat on my face in front of a crowd of people. Well, if I was still doing that, I could definitely add crying on the streets of Avondale to the latter column. I can’t remember the last time I cried in public, and this was quite humiliating. We’d just seen our first possible wedding venue, which I had high hopes for (FIRST BIG MISTAKE). It wasn’t quite what I thought – smaller and dimmer than the stunning pictures I’d seen suggested – and the proprietor was both intimidating and reticent. Interviewing is the worst part of my job, for me, especially in-person interviews. Love the writing; not so much the dealing with people. And it’s been a long time since I dealt with someone so … not forthcoming. Someone I had to drag every word out of. Not the kind of person I want to be dealing with when it comes to wedding planning. We left, crossed the street to where T’s motorbike was parked, and I melted into a hot, teary mess. I think I was PMS-y at the time, and blubbed for about 10 minutes. It was a totally disproportionate reaction to the situation, but that’s what went down. Bridezilla, stay your ground. So, not the most auspicious start to wedding venue recon. The next place, while there was a bit of a kerfuffle to get there (a bit of phone tag, T having to work late and throwing our appointment into jeopardy, etc), was an entirely different experience. The staff at this affordable wedding venue in West Auckland were friendly but laid-back and instantly made me feel at ease. The deal was sealed when I learned the onsite chapel is being de-sanctified. I may have said this before, but neither of us is religious, so a church wedding didn’t feel right to me. A church that isn’t a church? So very, very us. So it’s official: the Corban Estate Arts Centre is the place for us, with its little chapel, and its ex-wine cellar that’s now a function room. Of course, it wasn’t as easy as that. We may only have visited two places, but before that came countless hours spent on Google, wedding forums, and so many venue aggregation sites. Aside from price, the other major issue was finding somewhere to hold both ceremony and reception. It was friggin’ impossible. Another two places I was seriously considering – and that would have been next on my viewing list – are Beaufords Totara Park and the Botanic Gardens, which would have catered for both parts of the wedding and had reasonable all-inclusive per person rates. Choosing Corban means choosing DIY over convenience. The thing about choosing a venue that is all about hosting events and has its own staff and does its own catering … is that much of the work is taken care of for you. Going the other route may be cheaper, but it means YOU have to take care of all the logistics. The former sounds appealing in many ways – I’d quite like to peel off into the sunset at the end of the day and have that be that – but at the same time, I’m really happy with this choice. It sets the whole tone for the wedding and reflects who we are – down to earth, unfussy, casual. T suggested having a backyard hangi for our reception many moons ago, which I promptly quashed. But we’re both definitely more homestyle BBQ than we are get-dressed-up-and-visit-a-five-star-restaurant. This feels right. And so it begins. 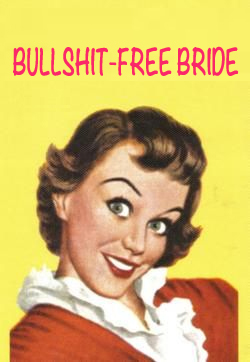 There’ll be posts in the future, no doubt, about my adventures in planning a BS-free wedding. I don’t have the time, energy or headspace to deal with any drama, and that is going to be my guiding principle. The venue looks awesome! My husband and I were also married in a “church that isn’t a church,” but didn’t have the reception there. We went with a community hall. I love the idea of a “No BS” wedding. Ours was a combination of BS and No BS, but there was definitely no drama! I can’t wait to hear more about your planning processes. I think it’s going to be really interesting! Great idea! I talked to a girlfriend recently who said she was thinking that she was the coolest bride to be on Earth, but her bridesmaid told her afterwards that she was denigrating so much every wedding stereotype that she set the bar even higher than bridezillas! Whew! I’ll be that’s a huge relief! I’ve never had to plan a wedding, but I imagine going with your gut and just knowing what “feels” right is a huge part of it so that it can be as stress free as possible…if that is even possible. Congrats on finding a location! I bet that’s a big relief. When I got married I was lucky enough to be able to hold it at a friend’s house. We had the ceremony there (non-religious) as well as a reception with hors d’oeuvres, limited drinks (wine, beer, soda, champagne for toasting) and cake. We invited only 50 guests, held it on a Sunday afternoon and wrapped up by dinner time. This really worked for us on many levels. Our family and guests seemed to appreciate that they didn’t have to commit an entire day and evening to our wedding, it was less exhausting for us, and it wasn’t very expensive at all. This was back in 1997 and the entire thing cost about $2,500. The cost was low due to not having pay for a venue (the use of the house and yard was the wedding gift of the friends) or the cake (which was a gift from my aunts who worked in commercial kitchens and knew how to bake well). We did cater the hors d’oevres and drinks, so they supplied all the glassware, plates, etc. I also saved a lot of money on a dress by buying something very simple and not marketed as a wedding dress. You can do this and not be super stressed out, just stick with your principles and figure out what is most important to *you. * It is your wedding after all, and it doesn’t have to fit anyone else’s specifications. If one of those things that matters to you is holding a wedding without getting into a lot of debt, then your family and friends should be supportive of you. Oh wow. How excitting! I love low-key intimate weddings. Congrats on finding a place! I will admit that I looked it up — it looks gorgeous! Oratia has a hall for hire that used to be a small catholic church. Details on Oratia.org.nz Oratia is a heritage area and the church backs onto a domain in a rural fruit growing area at the foothills of Waitakere Ranges. There is also a larger hall that is an ex packing shed, and still has timber ceilings floor etc. for larger weddings. You are my new best friend. Thankyou for this.